Get an amazing close-up look at one the world’s largest land vehicles — the crawler-transporter used by NASA. This incredible machine is 131 feet (40 m) long , 114 feet (35 m) wide, and weighs no less than 6 million pounds (2.7 million kg). This behemoth has eight tracks, each larger than a bus. The in-deck diesel engines create a combined output of nearly 8,000 horsepower. Those engines drive generators that power the tracks. The crawler-transporter was created almost 50 years ago to allow NASA to transport the full Saturn rocket on a 4.2-mile (6.8 km) trek from its build location to the launch pad. That journey is down a long, broad road with a surface of loose stone and a deep substrate. The crawler is a feat of mechanical engineering designed to carry a 12 million pound (5.4 million kg) rocket in a vertical position while crossing grades of up to 5 degrees. Watch a time-lapse video of the crawler in motion here. A team of eleven is required for the trek, according to NASA. The team includes a driver, four navigators who keep the driver up to date on location and acceleration, and six operators. When the crawler is loaded with a rocket or space shuttle, it moves at speeds of approximately 1 mph (1.6 km/h) and burns 150 gallons (568 L) of fuel per mile. The crawler-transporter was originally built for NASA by Marion Power Shovel Company of Ohio, and in 1967, the year it began service, the crawler cost $14 million. 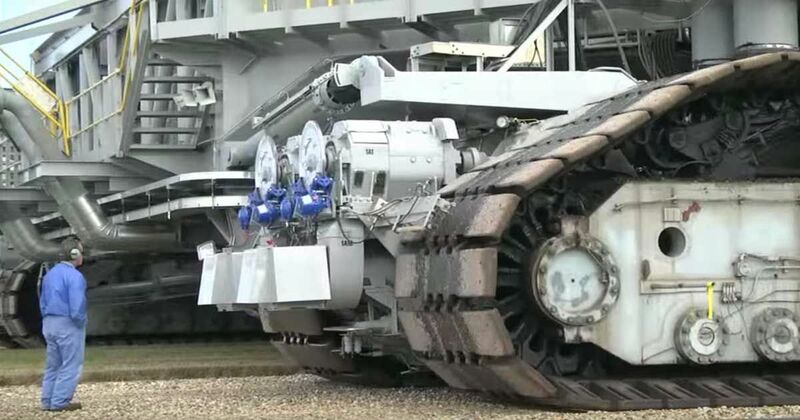 Watch another fascinating video of the crawler below, and SHARE if you’re a fan.